In our sessions, Laurie has been a counselor, cheerleader, spiritual guide, referee and shoulder to cry on. Whatever role she plays, my family is always left feeling enlightened and grounded. 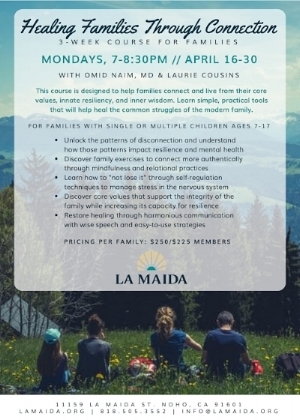 Mindfulness for Families Workshops, Classes, or Intensivies can be brought to schools, religious communities, non-profits, etc. Laurie is the family program advisor at the la maida institute along with where she has her private practice. Families face a lot of challenges in today's society: finding the right fit for your child/ren's education and extracurricular activities, the pressure of academic achievement, keeping up with social media and peer relationships, etc...and that is just for the children! When do we parents get to enjoy our families? Or have "me" time? Many of us are over-scheduled, over-stimulated and over-tired. It is time to slow down, get out of automatic pilot mode, connect to one another and savor what is already here. How do we do this? One way is through Mindful Awareness Practices.